Jeera Rice or Cumin Rice is a simple flavorful rice main made by cooking Basmati rice with whole and ground cumin seeds. 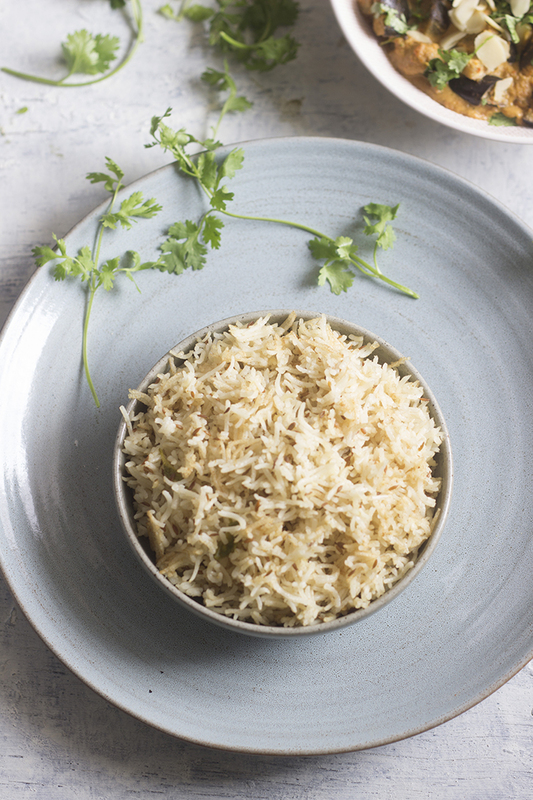 Jeera Rice is earthy, fragrant, healthy and delicious. It also fits into various diets - vegan, gluten-free and plant based with no or minimal alterations. I always considered December as the slowest month of the year at work. With everyone in the world looking forward to the holidays and doing their last minute holiday shopping, baking boozy cakes, and making travel plans. This year hasn't turned out to be that - Slow. Come December, and I've been busier than usual at work, and it may have something to do with the holidays. May be everyone wants to complete what they started before going off to enjoy some quality time with family. And that means we are all working twice as hard and scrambling to get stuff done at office. All in all, extremely exhausting and stressful. Add in all those pending treats from friends and dinners with family. It's led to me barely cooking on weekdays. And when I am stressed out or busy, all I look forward to is comfort food. And my idea of comfort food is simple Indian food, especially, Rice. I hate to say this, but I think I secretly like rice. I spent a better part of my life, telling people how much I hate rice and how much I love wheat. If it was a battle of the cereals, my teenage self would have fought front and center of the wheat army. But now a days, I realize that although I eat wheat more regularly than rice, I tend to lean towards rice when I need comfort. And with such chaos at work, I've never needed more comfort. And this Jeera Rice is that and more. 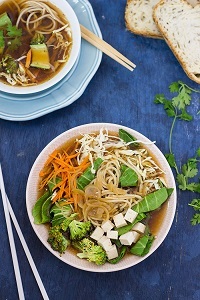 It is flavorful comfort food that is easy on your body and time. This Jeera Rice is not hot nor heavy on the spices, but it is definitely not flavor less. It has loads of that earthy cumin flavor. Plus it has the fragrance of Basmati Rice. You can get all chefy on this recipe and add all sorts of whole spices, but I kept it simple. Of all the spices out there, Cumin has to be my favorite. I add cumin to my tadka all the time. You can make Jeera Rice two ways, one by tempering leftover rice with cumin seeds and the other by cooking raw rice along with cumin seeds. This recipe is the latter. I made this Jeera Rice in a pressure cooker, you can also make it in a pan or in a rice cooker. 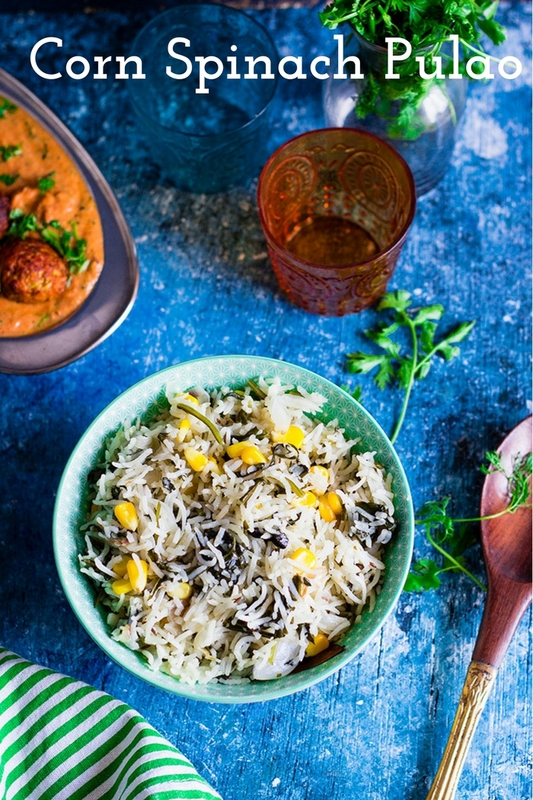 Jeera rice is Vegan, gluten free and healthy. It can also fit into a plant based diet, by totally eliminating the oil in the recipe. 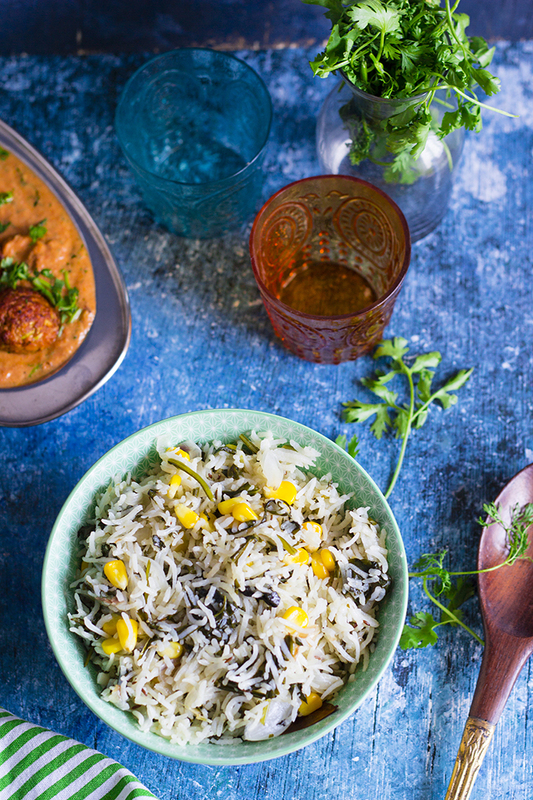 Jeera Rice is almost always accompanied by a flavorful Dal. There are several recipes of Dal on One Teaspoon Of Life that will go wonderfully with this Jeera Rice. Jeera Rice is a vegan and gluten free rice main dish made by cooking basmati rice along with cumin seeds. 1. Wash the basmati rice 5-6 times until the water runs clean. Drain and keep aside for 30 minutes. 2. Heat oil in a pressure cooker and add cumin seeds. 3. Once they brown slightly, add in the chopped green chilli. 4. Add the basmati rice and mix until the oil coats the rice grains. 5. Add in the water and cumin powder. 6. Add salt to taste. 7. Cover and pressure cook for 2-3 whistles or 5-8 minutes after the pressure builds up. 8. Serve hot with dal. 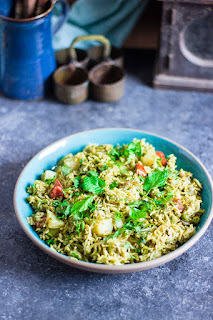 Mint Rice or Pudina Pulao or Pudina Rice is a simple vegan one pot dish of fragrant Basmati rice cooked along with a fresh mint puree, vegetables and spices. Perfect for weeknights when you are short of time. Monday blues came in early this week. I had a one day weekend. Just Sunday… Sigh! I technically had a Saturday, but that was spent attending an event at Office and all my usual Saturday stuff landed into my Sunday and I was left with no rest day. Between my load of laundry and dusting the house, I have absolutely no idea where that Sunday just disappeared into thin air. Literally, I blinked and my weekend was over. I’m a planner, at least I try to be most of the times. Not necessarily execute all that I planned but plan I do. My weekly meals are all well planned on Saturday. I buy all the groceries and vegetables over the weekend and chalk out a small menu on a post it and stick it onto my fridge. This way I don’t need to stress out on weekdays wondering what to cook next. I still fret around about what to cook, but that fretting is now limited to Saturdays. I also wash all my vegetables and fruits on the weekend and sometimes chop them and store them in the fridge to make my weeknights easier. With my erratic work schedule, I need all the prep I can do. Guess what happens when the planner loses one day of prep time. She panics!!! That’s when come out simple recipes that can be whipped up in a jiffy. And so I made this evergreen Mint Rice or Pudina Rice. I did not have to go out and buy anything. Well… at least not the hero of the dish – the Mint. I’ve spoken a lot about my little Mint patch many times before, so I won’t bore you with that once again. This Mint Rice requires no prep in advance at all. It also uses exactly 2 vessels – the blender or mixer and the pressure cooker. Just blend together the mint, coriander leaves, spices, ginger and garlic and cook it along with the rice and some optional vegetables in the pressure cooker. You can use your rice cooker or even a deep saucepan to make this Mint Rice. I added potato, tomato and green peas. You can skip them or go ahead and add vegetables like green beans or broccoli. I assure you it will taste amazing. Mint Rice tastes great with mixed vegetable Raita or plain yoghurt. 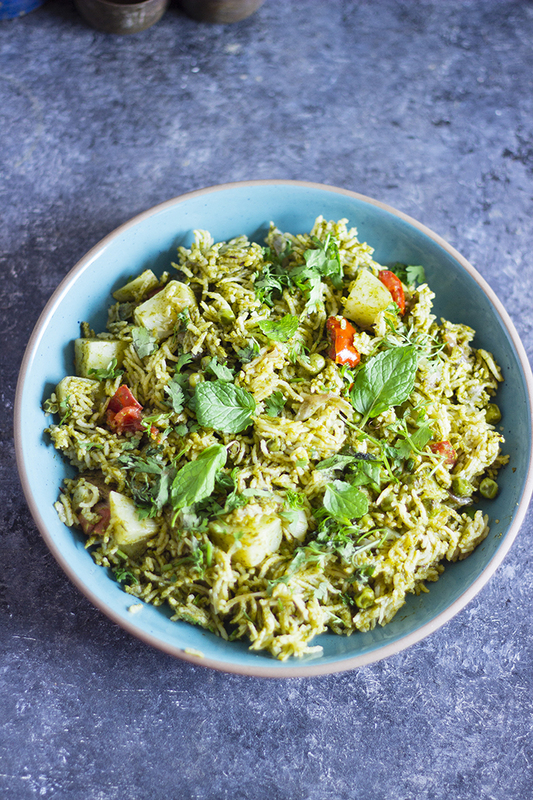 Mint Rice is a one pot dish of rice cooked along with a mint puree, vegetables and spices. 1. Wash the basmati rice until the water runs clean. Drain and keep aside. 2. Slice the onions and chop the tomato. Peel and dice the potato. 3. In a blender or mixer, blend together the mint leaves, coriander leaves, green chilli, ginger, garlic, coriander powder, cumin powder and juice of half a lime along with 1-2 Tbsp water to a smooth paste. 4. Heat oil in a pressure cooker and add the cumin seeds, cloves, cinnamon and the bay leaf. 5. Fry for 1 minute on medium heat or until fragrant. 6. Add the onions and fry until browned slightly. 7. Now add the green peas, potato and tomato and fry for 30 seconds. 8. Add the mint-coriander paste and mix well. 9. Add in the rice and mix well. 10. Add 1.25 cups of water, garam masala and salt to taste. 11. Cover and pressure cook for 2-3 whistles or 5-8 minutes after the pressure builds up. 12. Serve hot with raita. 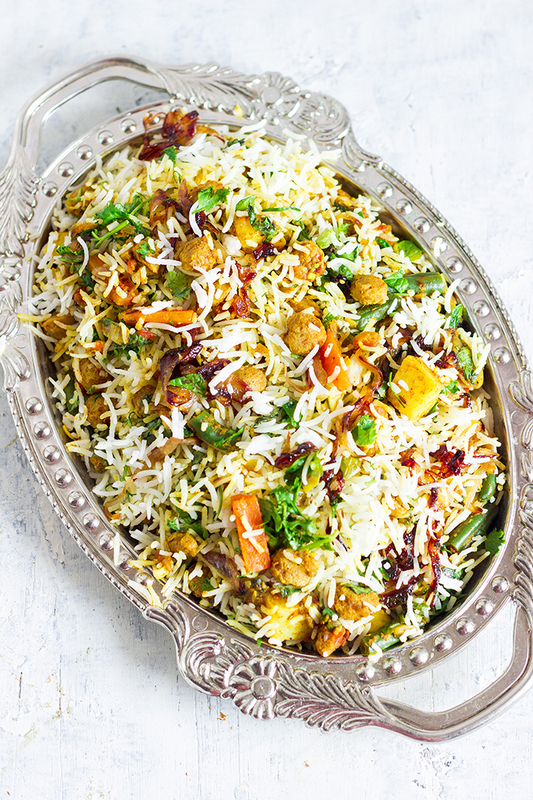 Soya Biryani is a spicy vegan layered rice dish made with nutritious soya chunks, mixed vegetables and fragrant long grained Basmati Rice. If you love Biryani, you have arrived at the right place. 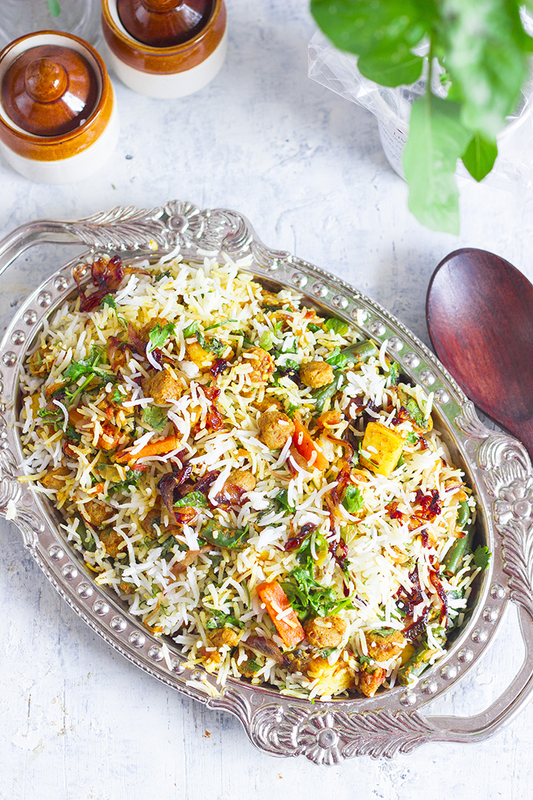 This Soya Biryani is meaty, spicy and fragrant and perfect when you crave carbs and something spicy. To be honest, I am not a Biryani fanatic like a lot of my friends. While a lot of my friends can eat biryani for every meal, I'm usually the one who refuses to accompany them and I'd rather settle for a simple meal of roti and a dry sabzi with lots of fresh coconut. But I enjoy the spicy indulgence occasionally, especially on a real bad work day or on Sundays, when I have all the time in the world to give to the Biryani. 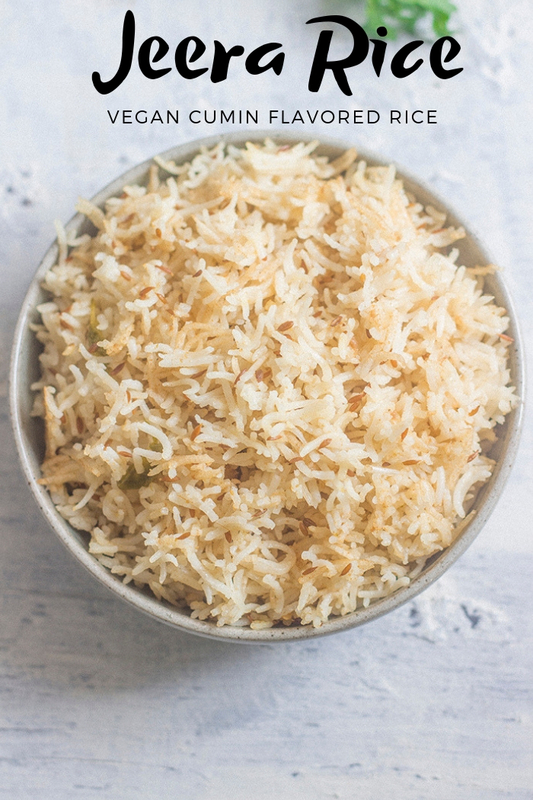 This Biryani recipe is my go-to recipe. I've made it with raw jackfruit, with mixed vegetables and with mushrooms, changing it ever so slightly at times. When I have ghee at home, I use that instead of the oil. When in mood, I use sour yogurt instead of tomatoes. But I keep the spicy masala the same, for the simple reason, because it works!! 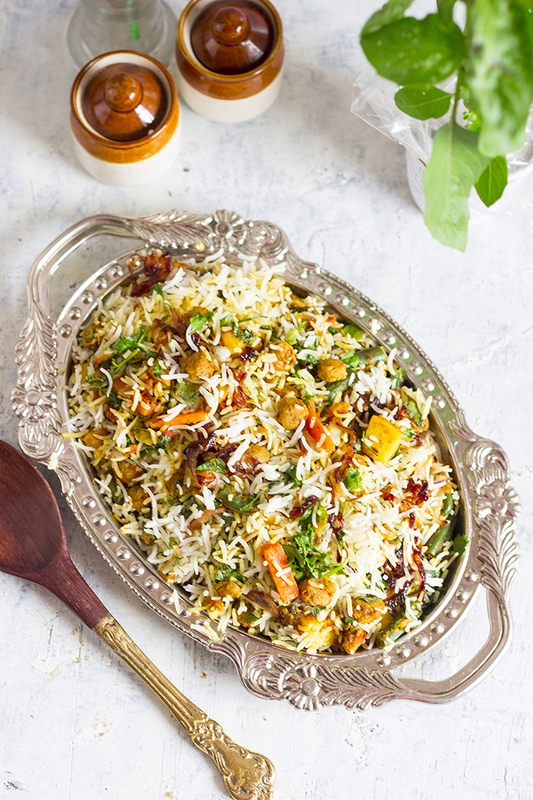 While there are good instant biryani recipes, to make the best Biryani, you need to give it love and time. You need to coax out the flavor of the spices by gently cooking them in oil. The tomatoes need to soften and come together with the spices. The birista or the fried brown onions needs their own time to crisp up and develop the flavor. While you may not miss much if you leave these steps out, but you will love it when you make it with patience. 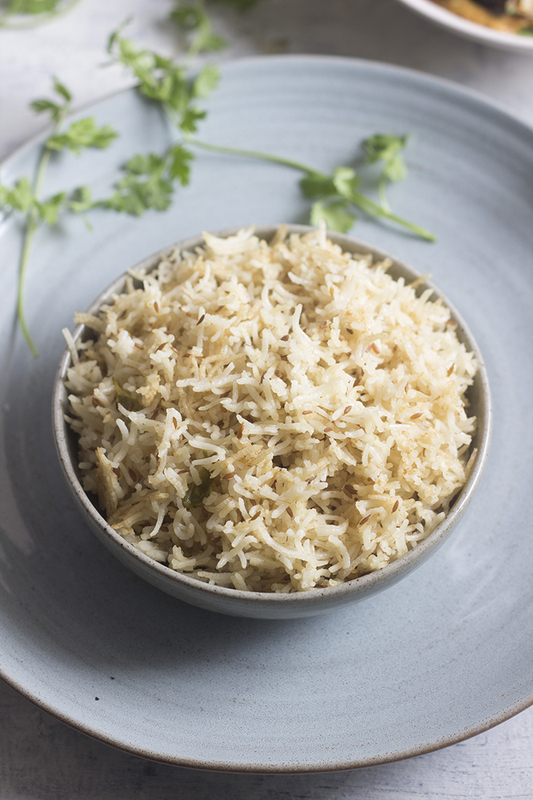 This Biryani uses mini soy chunks as the main ingredient. Since soya chunks are porous and meaty, they absorb the flavors of the spices perfectly. Cook the soya nuggets or chunks as described on the packet or just soak them in hot water and squeeze out the water to use them. 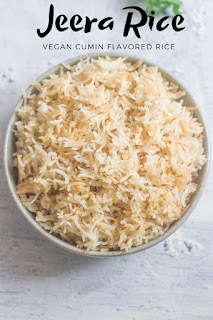 This Soya Biryani can be prepped in advance - the birista can be made much in advance and store it in a air tight jar until you need to use it, the vegetables can be parboiled the previous day, the rice can be washed and cooked the previous night as well. And if you know you are going to be stretched for time the day you want to make Biryani, make the masala - until you cook the tomatoes, in advance and store it in the fridge. The oil and salt will preserve the masala well. Add the vegetables and soya chunks on the day you want to make the biryani. 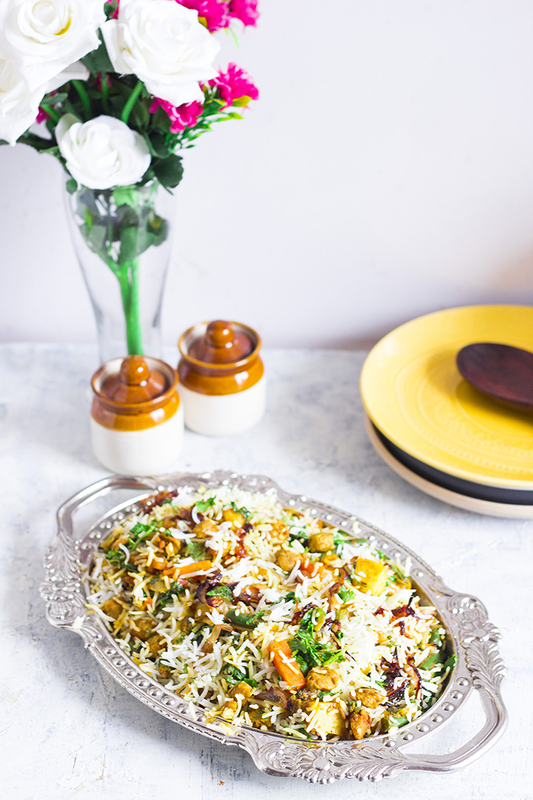 Biryani is best served with raita and if you like more spice, then salan. 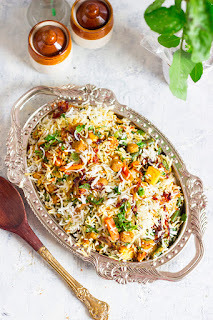 Soya Biryani is a vegan layered spicy rice dish made with nutritious soya chunks and mixed vegetables cooked in a spicy tomato masala and fragrant basmati rice. 1. Wash the basmati rice 5-6 times until the water runs clear. Soak for 20-30 minutes. 2. In the mean while, chop the carrot, beans and potato into chunks and parboil them with a little salt. 3. Soak the soya chunks in hot water for 15 minutes and squeeze out the water once soft. Or cook the soya chunks as instructed on the packet. 4. Boil 1.5 cups of water in a pan and add a pinch of salt to it. 5. Drain the basmati rice and add to water. Cover and cook on low to medium heat until the rice is almost done. Remove from heat and fluff the rice when slightly cool. 6. Roughly crush the green cardamom, cloves, stone flower, fennel seeds and cinnamon. 7. Heat 3 Tbsp oil and add the caraway seeds. 8. Add the roughly crushed spices and bay leaf and fry for 30 seconds until fragrant. 9. Add chopped onion and ginger garlic paste. Saute until the onions are browned. 10. Add finely chopped tomatoes and saute for 2-3 minutes. 11. Add the turmeric powder, coriander powder, cumin powder, red chilli powder, biryani masala or garam masala powder and salt and mix well. 12. Cook on low heat until the tomatoes are soft. Adjust salt or spices as required. 13. Add the soya chunks, parboiled carrots, beans and potato. Mix well and cook for 5-6 minutes. 14. In a clean non stick kadhai, spread out half the cooked masala. 15. Layer half the basmati rice on the masala. 16. Top with half of the chopped coriander leaves, mint leaves and the fried onions (birista). 17. Sprinkle a little salt and add 0.5 tsp of oil. 18. Layer the remaning soya masala. 19. Layer the remaining rice. 20. Top with the remaining chopped mint leaves, coriander leaves, and fried onions. 21. Sprinkle a little salt and add the remaining oil. 22. Cover and cook on low heat for 10-12 minutes. 23. Mix while serving. Serve hot with raita. 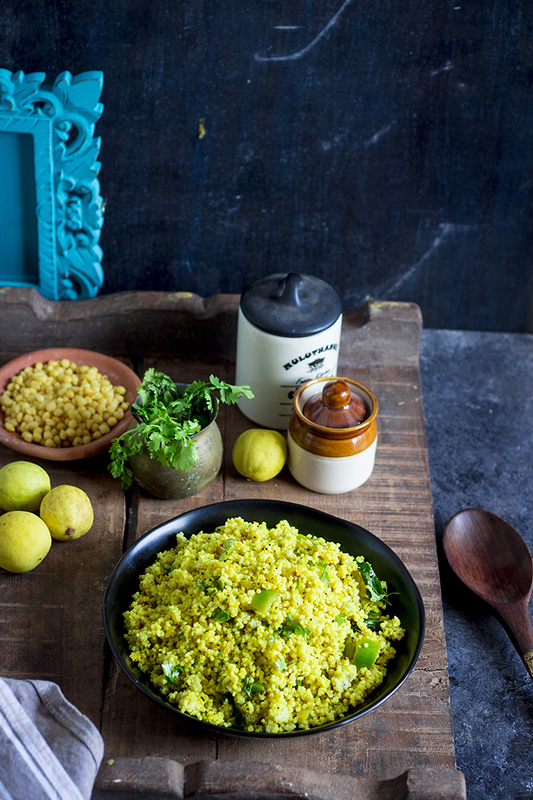 South Indian style Lemon Rice made with little millets or samai. I've newly discovered my love for millet - those ancient grains. Off late I have been trying to eat healthier at night. My best friend lost a lot of weight by just avoiding eating rice at night, and I am inspired. I decided to give it a try. Although I'm not much of a rice person, there are nights when all I want is some rice and curry for dinner, you know, comfort food. Especially when I've been stressed out at work and the night is unusually chilly, which it kinda is with the monsoons setting in. In my bid to avoid rice, I've found a best friend in millet. Millet are the best replacement for rice, they taste like rice and they cook like rice. They just are smaller in size, more like broken rice. And right now, they are a rage. With an entire society reeling with obesity and health issues, everyone is trying to eat healthy, organic, seasonal and local. And millet have gained a large following thanks to that. They are also very nutritious and full of fiber. There are several varieties of millet available with Foxtail millet and Little millet being the closest to rice (according to me). They can also easily replace Quinoa in a recipe, they are much cheaper than quinoa, and close to its nutritional value. Millets are also gluten free. You can read more about millet here. Now, to my recipe - Millet Lemon Rice. 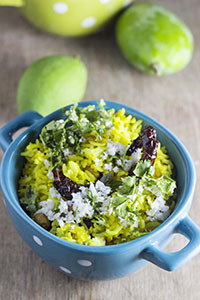 Lemon rice is a very common and popular way to use leftover rice in South India. I have replaced the rice with little millet in my recipe. Just like the regular Lemon Rice is best made with a day old rice, millet lemon rice is best made with cooled cooked millet, preferably a day old. I used half day old millet and it turned out perfect. To cook millet either follow the directions on the packet or cook it the same way you would cook rice. I cooked mine in the pressure cooker, you can cook it in a pan on the stove top or in a rice cooker. 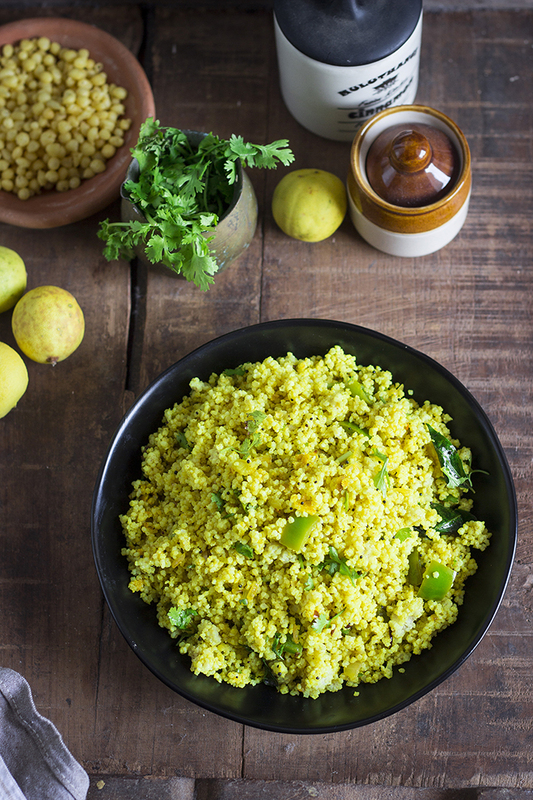 While tempering the lemon rice, you can add peanuts or cashew nuts to add crunch to the dish. You can also skip the onions and capsicum and just make it plain. 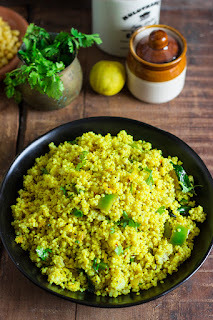 Millet Lemon Rice can be served as breakfast or meal. It is easy to carry in a lunch box. It can be accompanied with Indian Pickle, Raita or crispy fried papads. Little millets or Samai are cooked and tossed in a tempering of mustard seeds, lentils, curry leaves, turmeric powder and lime juice. This is the perfect way to use left over millets. 1. If using uncooked millets, soak them in water for 30-45 minutes. You can soak them overnight as well. 2. Drain out the water and pressure cook with 2 cups of water and a pinch of salt until done (2-3 whistles). If you don't have a pressure cooker, just cook it the same way you cook rice. 3. Fluff it with a fork and keep aside to cool. 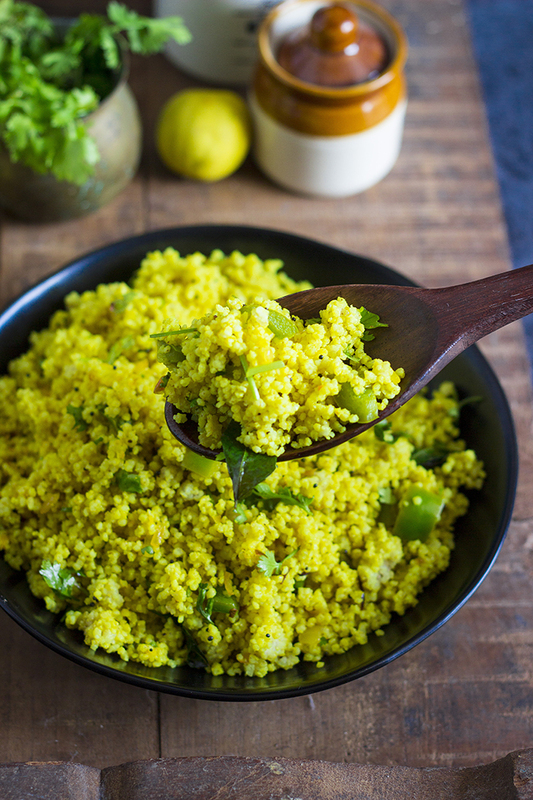 Lemon rice works best with a day old millet, so you can prep this a day in advance. 5. Once the mustard seeds splutter, add the chana dal. Allow it to brown slightly. 6. Add the curry leaves and chopped green chillies. 7. Add finely chopped onion. Saute until the onions are browned. 8. Now add roughly chopped capsicum and saute for 3-4 minutes. You can add Cashews or peanuts too. 9. Add the turmeric powder, salt and juice of half lime. Mix well. 10. Add the millet and mix well. 11. Now as per taste, add in more lime juice, sugar and salt. 12. Garnish with the chopped coriander leaves. 13. Serve hot with raita. Steamed bowl shaped dumplings made from rice semolina. Vegan and gluten free! Does Breakfast excite you? Are you a cereal from a box person or someone who likes to cook an elaborate first meal of the day? Or a mix of both? I believe I am a mix of both. There are days when I prefer just bread butter or a simple Coriander Chutney Sandwich, and there are others where I like to put in my love and effort into my favorite meal of the day. Especially on weekends. And this "Battalu Kadabu" has usually been on my weekend breakfast menu, because I believed it took time to make it, until now. I made this on a weekday and actually timed it. And it took me 50 minutes from start to finish to make this and it fed 4 people. And I believe I even ended up taking 50 minutes because I attempted to shoot a video while cooking it. But I don't believe I will make this on a weekday again because I never have that much time to spare on a regular weekday morning, but I definitely don't mind eating them. So what is this Battalu Kadabu. "Battalu" means bowl in Kannada and "Kadabu" is usually a steamed dumpling. So this dumpling is called so cause it is shaped like a bowl. I learnt this recipe from my mother in law. It took me a few tries to get it right. This dumpling is made with rice semolina. It can also be made with rice flour, but I prefer the rice semolina version that I am sharing. Rice semolina is cooked in boiling water to make the dough. The dough should be slightly sticky and pliable. It should not crumble, if you want to shape the kadabus. If you are struggling to shape it like a bowl, just shape them like little discs. The taste will not differ with the shape. I love this Battalu Kadabu because it is light. It does not fill me up to the brim and make me sluggish all day. It is vegan and gluten free. Serve it warm with a good spicy coconut chutney like this tondekai chutney made from ivy gourds or heerekai sippe chutney made from ridge gourd. If you are not vegan, fill up these rice cups with some golden ghee, it is delicious. Steamed dumpling made of rice semolina (rava), eaten as a breakfast in Mangalore along with Ghee and coconut Chutney. 1. Heat the water in a kadhai or deep pan. 2. Add the salt and coconut. Allow the water to come to a rolling boil. 3. Slowly add the rice semolina while stirring continuously to avoid forming lumps. 4. Keep stirring and cook it until everything comes together as one mass. This may take 5-6 minutes. 5. Remove from heat onto a dry plate and allow it to cool slightly. 6. Knead it for 3-4 mins, if it feels dry, add a little water and knead. 7. Pull out a small lemon sized ball and flatten it. Using your fingers make a small depression in the center and continue to gently press the edges to make a bowl shape. See video for reference. 8. If you are struggling to make the shape, just flatten them into little discs. 9. Grease the steamer plate. 11. Enjoy it while its hot with some spicy coconut chutney. 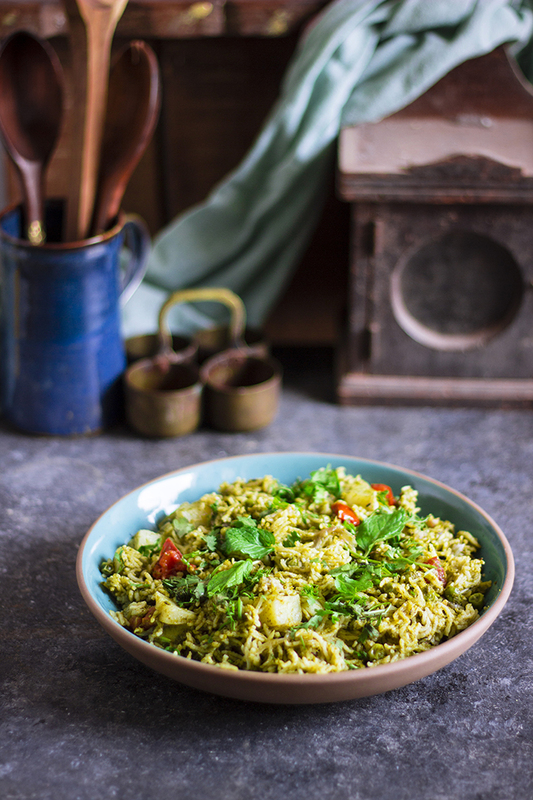 Corn Spinach Pulao - Delicately spiced Indian pilaf made with fresh spinach, sweet corn and whole spices. This Corn Spinach Pilaf / Corn Palak Pulao was long in the making. To those who are new..ish here, we have a small balcony garden where weve been growing a few greens and vegetables. I love eating what we grow, I know it is genuinely organic. There is no pleasure greater than knowing that the food you eat is as healthy as it should be. We feed our plants with compost that we make at home again. Around 1.5 years ago, we started composting our kitchen waste and have not looked back since. Again, that is one soul satisfying venture that lets us keep garbage out of land fills while making enriching compost for our own garden and all it takes is 10 minutes of our time daily. A few weeks ago, I planted spinach in one of the grow bags out there. If you are just starting out in gardening, spinach is the first thing you should grow. It grows so easily. You plant it and water it once a day and you will see those tiny green leaves popping out in no time. And you now have a fresh supply of baby spinach ready to pluck when you want. When I have home grown vegetables, I usually make a salad or something similar to let my veggies shine. 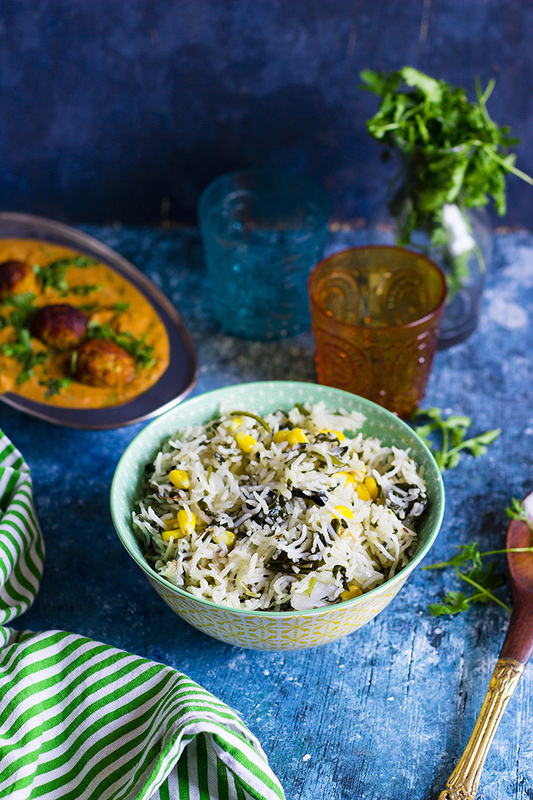 This Corn Spinach Pulao is exactly that. It is simple, delicate, fragrant and so super easy to make. This is a classic OPOS dish - One Pot One Shot. To make the perfect Corn Spinach Pulao, use the best quality ingredients. This is a very simple dish, so there is nothing much to hide behind. Select the best Basmati Rice , preferably something that is long grain and aged. You can use either fresh or frozen corn. And definitely, use the freshest spinach you can get. 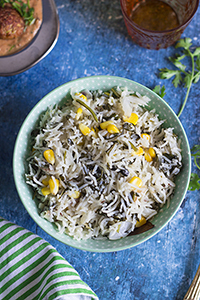 Corn Spinach Pulao is a delicately spiced Indian pilaf made with fresh spinach, sweet corn and whole spices. Vegan and gluten free. 1. Wash the basmati rice 4-5 times until the water runs clear. Soak and keep aside for 20 minutes. 2. Slice the onions. Wash the spinach thoroughly and chop it. 3. Drain the rice and keep aside. 4. In a large thick bottomed pan, heat oil. 5. Once the oil is hot, add bay leaf and cinnamon. 6. Add all the other whole spices and fry on low heat for 1 minute. 8. Add ginger-garlic paste and fry until the onions turn golden brown. 9. Add chopped spinach and sweet corn. Stir fry for 1-2 minutes until the spinach wilts. 10. Add the basmati rice and water. 11. Add salt as per taste. The water should be salty when you taste it. 12. Cover and cook on low heat until the rice is cooked. It should take around 15-20 minutes. Vegan Maki Sushi Roll made by rolling avocados, cucumber and carrots in sushi rice and Nori sheets. Remember here, I spoke of Gee going to Malaysia and shopping in super markets? It paid off, a second time!! It is she who bought me the Nori Sheets and the Sushi Rice all the way from a Japanese store in KL. (You can buy them in Gourmet stores in Bangalore or buy them online ). Well, she looves sushi. And this time she got to eat them sitting at home in her pajamas without worrying if they are really vegetarian. Win-win! I always knew of sushi as a raw fish dish. But the first time I heard of a vegan one was when I was in California and my friend wanted to make me try some. I did not get the chance to try there, but I did try it the first chance I got once I was back in Bangalore and the love affair has continued since. Every single time I see a vegan sushi on the menu, I order it. This was my first time making it at home, but it definitely won't be the last. Making sushi is really not that difficult, if you have the correct variety of rice. A lot of recipes online say you can use quinoa or brown rice or some other variety of rice. While I'm sure you can work with them if you are a pro at sushi making. For an amateur, sushi rice works best. This rice is very different from the other varieties of rice in my pantry. It is sticky, yet the grains hold their shape. Any Indian rice when cooked to become sticky, will turn mushy and become paste like. And that is definitely a no-no for sushi making. You want to be able to identify the grains, yet have them stick to each other. I was scared when I rolled my first roll, but the rice made it impossible for me to mess it up. So say what you may, according to me it is the rice that is the hero of the sushi. Making the rice is simple, you cook it as per instructions on the packet. Then spread it out in a large bowl or plate and mix in the vinegar , sugar and salt while smashing the rice a little. Adjust the vinegar, sugar and salt to your taste. Once your rice is ready, you can fill your rolls up with basically anything. Keep it fresh and simple. I filled my rolls with avocado, cucumber and carrots. And for a few, I threw in some sauteed mushrooms as well. The flavor of a sushi comes majorly from the rice and the nori sheets. Nori sheets give the sushi a mild fishy umami flavor. Serve sushi with a good quality Soy Sauce , Pickled Ginger and Wasabi paste . Note: Sushi is usually rolled with a bamboo mat, but the technique is achievable with a kitchen towel and a plastic wrap. Watch the video for more details! Yield: Serves 3-4. Makes 27-30 individual rolls. 1. Wash and cook the rice as per instructions on the packet. I rinsed the rice once and pressure cooked it with 2 cups of water for 10 minutes on low-medium heat. 2. Once the rice is cooked, remove it into a large steel or wooden bowl or plate. Heat the vinegar in a small pan, add the sugar and salt. Once the sugar has dissolved, remove from heat. 3. Add the vinegar to the rice and with a wooden spoon, mix it well. The rice should be sticky, yet retain the grain structure. Allow it to cool. 4. Slice the avocado and julienne the cucumber and carrot. 5. Take a kitchen towel and spread a plastic sheet on it. I used a clean plastic packet in which I had purchased rice. I cut it into a rectangle and laid it on top of the kitchen towel. 6. Place the nori sheet, shiny side down on the plastic sheet. 7. Take 1/3rd of the rice and place it on the nori sheet. Wet your hands and spread the rice until it covers the nori sheet. Layer it as evenly as you can. It doesn't have to be perfectly even, the rolling later will ensure it spreads evenly. 8. On one edge, place 1/3rd of the cucumber, carrot and avocado. 9. Gently roll the nori sheet until the vegetables are covered. Use the kitchen towel now to compress the vegetables. 10. Continue rolling until the full nori sheet is rolled up. 11. Using the kitchen towel, compress the roll. Turn and compress again. 12. With a sharp wet knife slice the roll into individual maki rolls. Wet the knife between each slice. Do not apply pressure while slicing, make gentle to and fro motions. The roll should be sliced in 2-3 knife movements. 13. Serve with pickled ginger, soy sauce and wasabi paste.